Being able to organize your clothing and shoes is one of the things that can make your trip easier and more pleasant. If you are a heavy traveler, you already know how important it is to own all the accessories you need in order to pack and unpack in the shortest time possible. Also, you might be aware of the fact that separating shoes from clothes, as well as clean from dirty garments is essential. Even if you didn’t travel that much, it is easy to picture how having travel shoe bags that help you organize better can change everything. No more ugly plastic bags, no more dirty clothes; that’s what you get when using high-quality shoe bags. Some of the best travel shoe bags on the market are highly convenient, as they come with sealing features and they prevent the smell from being spread in the suitcase. At the same time, it makes organizing your stuff so much easier. When traveling, it is important to keep your luggage as light as possible for your own comfort. Also, it is essential to organize your clothing and shoes efficiently, so that you can find them easily. 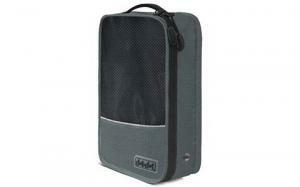 This shoe bag is ideal for traveling, as it is light and serves as an organizer. It is made of high-quality fabrics, it has zipper closure and a top mesh panel that allows he air to flow freely but keeps contaminants away. It has a rectangular shape, it is soft sided and includes shoe separators to avoid them from scratching. This shoe cube measures 13.75 x 7 x 4 inches and is extremely lightweight. It has a hole on each side makes the airflow possible. It is suitable for transporting all kinds of shoes, but also for home organization. If you have a large closet and many shoes, but you don’t want to expose them all on your shelves, then this accessory is exactly what you need to keep the dust and harmful sun rays away. Thanks to the top handle of this shoe bag, it is easy to carry around. Another great option if you are looking to buy a travel shoe bag is this product from Tuff Guy, which is made of nylon and it was designed to protect the shoes from scratches, abrasion, tears and scuffs. The great thing about this product is that it can be used to store a variety of other things, except for shoes. It makes a great home organizer and if you want to put away clothes, pieces of fabric, laundry, shirts or underwear, you can use several bags such as this one. This shoe bag measures 16 x 13 inches, it is waterproof and has zipper closure. Basically, if you need a shoe bag with a simple design, that is easy to use and resistant, this pack is great for your needs. There are 4 bags included in this pack, which makes it highly convenient. This product is suitable for shoes up to the size 14. It is easy to find and open, thanks to the sewn-in identifier and red European zipper. Also, it has a top handle that can help you transport it easily or draw it from your luggage fast. The nylon it is made of keeps dust, bacteria and moisture away, so it is a great accessory for shoe care, too. When you first see this 6-pair shoe organizer, the first question that probably pops into your head is: why would I need such a large organizer for my trip? The answer is really simple and you probably already know it. There are so many reasons why people want to take more than two pairs of shoes with them on their trips, especially when it lasts more than 3 days. Weather, different types of events and even comfort, are just three of the main factors that influence this decision. 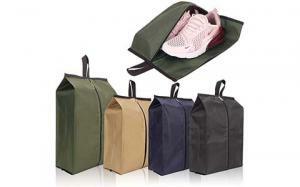 This shoe organizer includes 6 bags that allow you to store plenty of objects, except for shoes. Also, it is suitable for home use and closet organization, too. No wonder why it stands in the top of the list when it comes to consumer preferences. This product is soft-sided, it is made of oxford cloth, it is breathable, yet waterproof and keeps moisture away. It comes with a hanging rope that makes it easy to hang. Thanks to its large handle, it is easy to carry around. Also, thanks to its rectangular shape and soft sides, it makes it easy for you to pack and unpack. It measures 8.4 x 7.7 x 1.1 inches , it comes in pink, green, blue and gray and it weighs only 6.4 ounces. If you are a passionate traveler, this shoe organizer is definitely for you. Another classy, yet practical and durable travel shoe bag is brought to you by Achiou, in a pack of 4 and in 4 different colors: black, beige, khaki and dark blue. If you need shoe bags that are stronger and larger than most of those that you can find on the market, you are in the right place. This product is more durable thanks to its double layered sewing edge which makes it capable to withstand more weight. Each shoe bag can fit a pair of regular shoes, from size 10 to 14, or two pairs of kid shoes. This product is made of waterproof nylon, so once the shoes are inside, you don’t have to worry about them anymore. Also, it keeps the dust and contaminants away. The fact that it isn’t even soft sided might represent a minus for some customers, but it is a plus for others, as it occupies less space, it is more lightweight and flexible. This product has zipper closure and a handle that makes each bag very easy to transport. It is very easy to clean and it dries immediately. If you are person whose style is impeccable, then you surely care a lot about every single detail, and you pay attention to every flaw that a product might have. So, if you are looking to buy a shoe organizer or a travel shoe bag, you want to find a perfect product that has a great design, that is easy to use and that protects your shoes. Not to mention that you would want the product to be practical and durable. 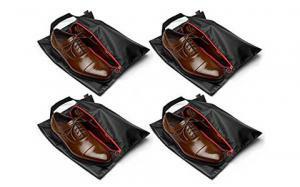 This pack of 4 shoe bags from Gyssien are perfect for traveling for a number of reasons. First of all, they are nicely designed, and they are highly functional. Second, they are water resistant, great for daily use and they come with a translucent window that gives you visibility over the shoes. Last, but not least, they can be used for a variety of other purposes. Some people use it as a toiletry bag, while others prefer to use it as a laundry bag during their travels. The pack includes two light gray bags and two dark grey ones. The dark bags are large (18 x 19 x 5 inches), while the light grey bags are medium sized (16 x 19 x 5). All 4 have zipper closure, a translucent panel, sewn in identifiers and a top handle that make them easier to carry. 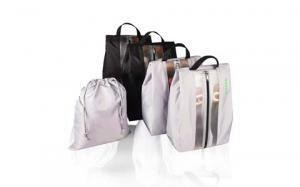 All bags are made of high-quality polyester, which makes this product durable and sturdy. Except for the 4 travel shoe bags that this pack contains, it also includes a free drawstring bag that you could use for any other personal stuff that you want to separate from the rest of your clothing when packing. Shoe travel bags that are durable can help you organize your shoes, as well as other personal belongings for years on end. They represent such a small investment in a great deal of personal comfort. However, most people don’t realize how important it is to own these accessories, that look quite insignificant at a first sight. Having them at hand can help you organize your closet better, your suitcases when planning a trip and can prove to be helpful in a variety of other situations. Everyone should own at least two or three shoe travel bags. Except for helping you keep everything clean, such a bag also helps you protect the shoe itself from humidity, other odors, dirt, dust, sunlight etc. Not to say that if you have small children, you will save a lot of time searching for missing shoes or trying to match them. These bags come in many sizes and colors, so you have a lot of options to choose from. Take a good look at the five products in our list and choose whichever is best for your needs.